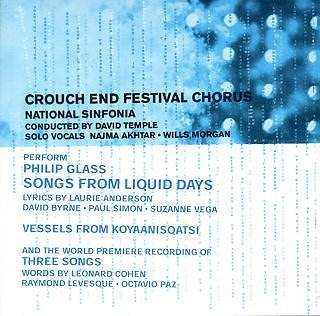 This album crosses the increasingly thin film music/classical divide offering Three Songs for Choir A Capella, Vessels (from the film score Koyaanisqatsi) and Songs From Liquid Days by noted classical and film composer Philip Glass. The first work was written as a commission for the 350th birthday celebrations of Quebec in 1984, the three choral songs playing for ten minutes and offering settings of texts by Leonard Cohen, "There Are Some Men", Raymond Lévesque, "Quand Les Hommes Vivront D'Amour" and Octavio Paz, "Piere de Soleil". Recognisably Glass but far removed from trademark minimalism, this eloquent pieces find the composer continuing the centuries old choral tradition in a way which may surprise detractors. The ideas are fresh and the melodies strong, the popular, acceptable face of modern classical music. Vessels is a single movement work lasting almost eight minutes and derived from the composer's score to the film Koyaanisqatsi (1983), the "life-of-the-planet" arthouse favourite which combined time-lapse photography with a wall-to-wall Glass score. Wordless women's voices come from the left, male voices from the right, the richly dynamic interplay often having the exhilarating effect of rapid sequencer runs. Eventually the voices are joined by rhythmic yet melodic orchestral parts, the instrumentation following the composer's original score; flute, soprano and tenor saxophones as opposed to later recorded versions. It is an attractive, joyful piece which, unlike the complete score, does not outstay its welcome. Dominating the album is the title work, a new 40-minute arrangement by Jeremy Marchant for orchestra and choir of Glass' song cycle Songs From Liquid Days. As Marchant notes, from the beginning he tried to keep the arrangement so idiomatic that those who did not know otherwise would feel it had been made by Glass. A further decision in the arrangement was to produce a work which could be produced live without excessive expense. Thus music originally given to brass and electronics was reworked for the choir, while the orchestra was limited to strings, piano flutes, organ and a lot of percussion. Any changes were made with the approval of the composer, such as some small cuts in "Changing Opinion" and the fading of the piano part in the same song. The cycle consists of six songs, "Changing Opinion" and "Open the Kingdom" featuring the tenor Wills Morgan, "Freezing" and "Forgetting" featuring Najma Akhtar, "Lightning" and the title song being for choir and orchestra alone. Texts are by pop-rock luminaries Paul Simon, Suzanne Vega, David Byrne and Laurie Anderson. The result is a work for which the phrase musical tapestry might have been invented, being richly lyrical, busily inventive, finely interwoven and filled with youthful American invention and surging dynamism. Building a work from lines such as "Love rolls out of the chair and wiggles on the floor" takes confidence, and somehow Glass pulls a lot of inconsequential "rock poetry" into something musically coherent and uplifting. From the thrilling opening of "Changing Opinion" the work goes through a sort of long dark night of the soul, with "Open the Kingdom" being a prayer for redemption leading to the stark "Freezing" and the valedictory "Forgetting", which ends with a list of reasons to live: "Bravery. Kindness. Clarity. Honesty. Compassion. Generosity. Bravery. Honesty. Dignity. Clarity. Kindness. Compassion." Tenor Wills Morgan sings the opening and "Open the Kingdom" with a resolute intensity, expecting nothing less than a positive answer. For the closing two sections Najma Akhtar takes over, her world music/rock background further suggesting how irrelevant genre divisions are becoming in the 21st Century. She balances a direct clarity of voice - if not that to which the classical world is normally attuned - with stoic resolution. The work ends with the choir in full flow listing the reasons to live, a stirring example of contemporary classical/art music finding a reason to live in art itself. This is an imaginative disc well recorded and very well performed which should satisfy both Glass aficionados and film music fans with a taste for large scale melodic choral writing. Songs From Liquid Days is that rare thing, modern classical music which leaves a big, happy smile on the listener's face.